Today I have a pretty pic heavy post to get to. I used Dance Legend Sahara Crystal polishes in #16 Amethyst and #51 Platinum for an accent. I also have a quick comp of #16 Amethyst and Zoya Carter further down the post. So all of these polishes are “textured”. Meaning they feel a bit rough if you don’t topcoat them. All of my pictures are without topcoat. I will add that tomorrow and do a quick update to the blog. There are some of you that can’t stand the feeling of a textured polish. I’m not one of those people. I don’t mind it at all. I do usually end up putting a topcoat on though, just to bring out all the sparkly goodness. Kind of like Matte polishes. 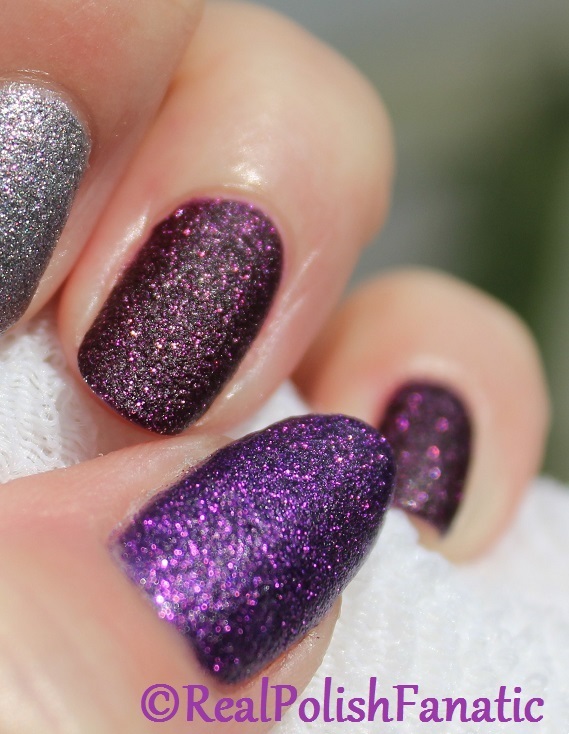 I don’t mind the matte look, but usually topcoat brings out a lot of hidden shimmer or sparkle. I bought Dance Legend #16 Amethyst from a blog sale a long time ago. The cap was broken when I received it, so I had to decant into an empty bottle I had laying around. I don’t think this color is available anymore sadly. Please say hello in the comments – I’d love to hear from you. Any requests for my blog? Previous Previous post: Billie Cosmetics Electric Blue — China Glaze Can I Get An Untz Untz?